The future pope’s role in saving Jewish lives during WWII remains little known today. Paul VI was never one of my heroes—he was the pope of my teens and early 20s, and as a personality he made little or no personal impact on my thinking. He was just the pope: quiet, pious, dignified, and presumably getting on with papal activity in a quiet, pious, and dignified way. I was, of course, aware of passionate opposition to Humanae Vitae, and also, as a journalist on a Catholic weekly, encountered the occasional ill-printed leaflet denouncing him, produced by extreme right-wing groups, sede vacantists, and/or conspiracy theorists. And there was a group announcing that he had been kidnapped and replaced by a doppelganger; you could tell it wasn’t the real pope by looking at his ears. However, most ordinary Catholics just saw Paul as a good man, doing perhaps the most testing job in the world. And then when he went to God, we had the drama of the election and loss of John Paul I, and the election of John Paul II—and we moved into a new era. It was exciting—no other word for it—being a Catholic writer/broadcaster/lay activist in the era of St. John Paul the Great, and I look back with gratitude. But my understanding of Paul VI underwent a dramatic change a few years ago, when I started to research the topic of Pius XII and the Jews in Rome in World War II. I was working on a book, since published, about Mother Riccarda Hambrough, one of the Brigettines who helped to re-found the Order with Mother Elisabeth Hesselblad at the start of the 20th century. Mother Riccarda—born Catherine Hambrough in 1887, baptized Madeleine when her parents converted to the Catholic Church four years later—joined the Order in Rome in 1911, taking the name Riccarda in honor of the English Brigettine martyr St. Richard Reynolds. By the 1930s the Brigettines were running a successful guest house and retreat center in the Piazza Farnese, in the original 14th century house where St. Birgitta of Sweden had lived when in Rome. When the Germans took over Rome in World War II, and Jewish lives were in danger, the Brigettines successfully hid a number of Jewish people in the house—part of a massive rescue campaign in which some 80 percent of the Jews in Italy escaped slaughter. It was an unforgettable experience to sit in the Casa di Brigida—still today a popular guest-house—talking to an elderly Jewish gentleman who, as a teenager, lived there with his mother, uncle, and other relatives. His personal story began with his mother’s friendship with Mother Elisabeth and the latter’s willing offer of help to the family into the house when danger threatened. He remembered the kindness of Mother Elisabeth and of Mother Riccarda, and the latter’s absolute conviction that the British would win the war. He also remembered the hunger, the soups made from whatever scraps of food were available—“I used the wonder if perhaps Mother Riccarda went out into the piazza and gathered herbs and leaves, because sometimes that’s all there seemed to be in the soup” —and the relief, in late 1944, when French troops arrived and hammered on the door, calling out that they were under command of General de Gaulle and that freedom was at hand. But what I had not known until I researched the story were the details of the organized hiding of so many Jewish people across Rome, in convents and monasteries, in Castel Gandolfo and in private homes. And while main credit must go to Pius XII—who received massive gratitude from the Jewish community and the state of Israel in the years after the war—the detailed work, the running-around on discreet errands, and the passing on of secret messages were down to his assistant, Msgr. Giovanni Battista Montini. 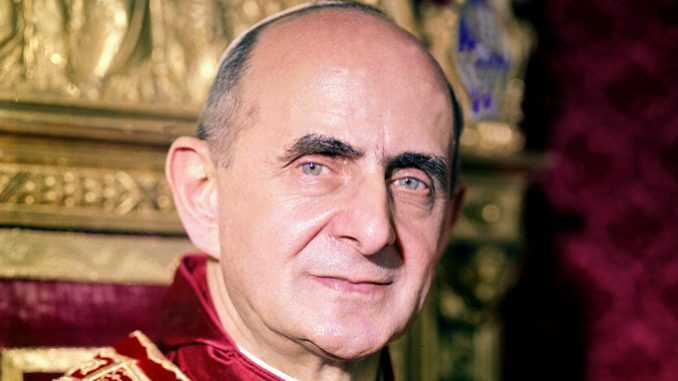 By the time Montini became Pope Paul VI in the mid-1960s, the years of World War II seemed distant: people were interested in the Second Vatican Council, in new debates about liturgy and ecumenism, and the Church’s role in the modern era. A whole chapter of Paul VI’s earlier life was ignored and is only now emerging as biographers and commentators take the longer view. In World War II, hiding people in religious houses wasn’t done via a broadcast on Vatican Radio, or a general letter inviting religious superiors to attend a planning meeting in the Vatican. This was wartime, under Nazi occupation. Things were achieved in secret conversations, notes passed in carefully-worded language, quick errands run by a monsignor hurrying with a message. Msgr. Montini was involved in dangerous work; he and all who helped to hide Jews took risks, and knew they were doing so. Pius XII was emphatic that all Jews must be helped—there was to be no question of urging them to become Christians, or setting other limits. Msgr. Carroll-Abbing, who was running Boys Town in Italy during the war, met with the pope several times through his rescue work and would later recall, “Most of the Jews under my care were unbaptised and committed Jews…they wanted to continue to practice their faith while in hiding and the Pope explicitly told me: ‘Do what is necessary enable them to continue to practice their faith according to their sacred Jewish rites’” (quoted in The Pius War, Lexington Books, Lanham, Maryland 2010, p.135). Pius XII sent a personal letter to convents and monasteries formally lifting their usual cloister rules so that Jewish families could be hidden there—this meant, for example, that nuns could care for men as well as for women and children within their convents, which was how the Piperno family could be hidden by the Brigettines. The help for Jews had begun before the war, when things were already beginning to look dangerous in Italy; in 1938 Msgr. Montini telephoned Dr. Guido Mendes, a Jewish longtime friend of Pius XII, to ask if he needed help, and the family was provided with Vatican documents enabling them to get to Switzerland. As pope, Paul VI brought the Second Vatican Council to a successful conclusion: its documents include the famous Nostra Aetate statement of religious toleration and of respect for the Jewish people. Back in 1955, as a monsignor he was offered an honor from a visiting Israeli delegation for his wartime help for Jews, but he refused it, saying that he had done no more than his duty and that any honor should go to Pius XII. 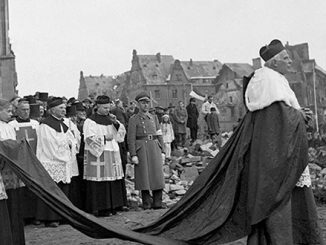 There were many, many stories of enormous courage in World War II, and young Msgr. Montini’s quiet acknowledgement was quite right. But it is fair for history to note his acceptance of his duty and the fact that he carried it out to the best of his ability. The courage then was echoed by courage of a different sort years later: he spoke insistently on the Church’s need to engage with the modern world in the face of endless criticism for doing so; he issued Humanae Vitae against considerable opposition; he endured shocking slanders; he faced the murder by terrorists of Prime Minister Aldo Moro, one of his closest friends for whose life he had pleaded so publicly. 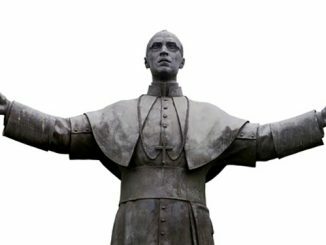 Even today, his memory is attacked, and groups including Archbishop Lefebvre’s Society of St. Pius X challenge his canonization, expected later this year. I think their successors will one day come to see that they were wrong—as they will also recognize the wrongfulness of their opposition to St. John Paul II. My own researches revealed what I should have recognized earlier: this was a pope following a path opened by Pius XII of walking alongside the oppressed and engaging with the specific needs of a fairly grim 20th century. He suffered for that, he should be honored for that, and we can invoke his intercession as a saint in the years ahead. The disasters in the Church that ensued under his pontificate cannot be ignored. Everything from the tidal wave exit of religious and the priesthood, to the banal destruction of the liturgy. To this day, the Church is still struggling to recover. Yes, he might have been a victim of the perfect storm of the sixties, but his response to that storm was tepid at best. The strange insistence of some of blaming Paul VI for everything that happened during his reign is bizarre. This hatred for the church and its popes, rather than a properly placed hatred for the secular forces that wracked the world in the 60’s is truly bizarre. For some, it is always blame the church first, last and always. If you were Pope at that time, you would have done a much worse job. If not “everything,” how much of what happened in 1963-78 can be be assigned responsibility for? Canonizing Paul vi is like awarding the passenger safety award to the Whitestar line on the grounds that it wasn’t their fault that there are icebergs in the ocean and that those who died didn’t have stamina to survive in the water until help arrived. Unfortunately, I think he also helped to generate that “perfect storm.” I often wonder how the Pope who gave us such documents as Mysterium Fidei, the 1965 document reaffirming the Church’s teaching on the Holy Eucharist, the 1968 Credo of the People of God, and most significantly Humanae Vitae could at the same time have almost single-handedly and willfully destroyed the Church’s liturgy and appointed so many bishops who were openly hostile to the very teachings he had re-affirmed. I cannot fathom Paul VI’s motives, but I an still reeling from the folly of so many of the policies he implemented unilaterally, often against the better advice of episcopal colleagues. I have seen some evidence that he came to regret many of his decisions, but the damage unfortunately can’t be undone. His record of bishop appointments is, indeed, execrable. In America, the Jadot bishops were his chief legacy – one the Church here is still recovering from. Indeed. Jadot was to episcopal appointments what Bugnini was to liturgy. He can be blamed for the Pauline reform of the Roman missal that happened under his watch. “Back in 1955, as a monsignor he was offered an honor from a visiting Israeli delegation for his wartime help for Jews, but he refused it, saying that he had done no more than his duty and that any honor should go to Pius XII.” This alone makes me like him. We can never know the full background of why certain things happened under his papacy. Let’s put a charitable interpretation on things, and invoke his intercession. You will find peace ( even final perseverance) granted, especially among / for one’s siblings. Thank you for your balanced comment. Have heard many very nasty inferences from other Catholic blogs re Pope Paul that I found quite disgusting. Blessed Paul VI – Pray for us. Msgr. Montini is mentioned in the wonderful 2014 documentary “My Italian Secret”. It is the story of some Jewish survivors of the Holocaust who were children at the time and were hidden by courageous Italians , both clergy and laity, who put their own lives at risk. 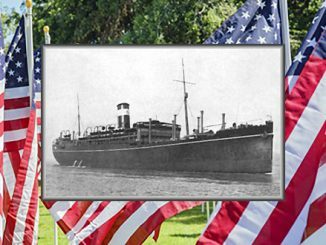 These survivors, now elderly, are shown returning to Italy to seek out and thank those who protected them. Pius XII should be canonized before Paul VI, if Paul VI is to be canonized at all. It is worth noting that Paul VI was quoted in the last year of his life by Jean Guitton in his book “The Secret Paul VI.” There he says: “There are books coming out in which the faith is in retreat … the Bishops are remaining silent … in my view this is strange … What strikes me … is that in the heart of Catholicism, it sometimes appears that a pattern of thought prevails that is not Catholic … and it can come about that this non-Catholic pattern of thought … could become more powerful … But it will never represent the thought of the Church. It is necessary that a little flock should remain ….” (p. 152-153). Of course, we wonder if there wasn’t something the Pope could have done to prevent this state of affairs, but as is very clear now, there are always forces in the Church that operate secretly. That is why the collapse of Catholic doctrine during and after Vatican II was so quick and widespread. The foundations had been laid especially in academia, seminaries included. Pope Benedict’s comments on subjectivism and relativism echoed long-standing warnings and prohibitions against modernism that were ignored by the Catholic intelligentsia. I am sure Paul VI was a good priest and his Humanae Vitae is a courageous testament to Truth in the face of great pressure to surrender to falsehood. As if Bugnini wasn’t bad enough, he also allowed those Protestant advisers too. What could possibly go wrong? Pope Paul VI surprised everyone, including the attendees of Vatican II who were winding up their activities, when he announced in December 1963 that he would travel to the Holy Land, a major change in papal tradition of isolation and an initiative that has benefited all his successors. Since Paul they can can identify themselves closely on the ground with the burdens and faith of the populace of the church. His priority in the Holy Land was to break the tradition of staying in Rome and its environs by arranging to meet with Orthodox Ecumenical Patriarch Athenagoras on that joint sacramental ground. Paul intended to start the reunification of Christianity and also to establish relations with Islam. Lost in the footnotes of history is that his tradition-breaking excursion to the Middle East began and ended In Amman, Jordan, where King Hussein, a descendant of the prophet, welcomed him as his official host at the aircraft and escorted him personally to its ramp when he departed. Jordanian Postage stamps circulated at the time pictured Pope Paul, Athenagoras, and King Hussein together with the optimistic implication that, if the three could be together, so could be their followers. As the only American of the 26 people with access and activities within the small compound where the visit was planned and executed and where the Pope stayed throughout, I became deeply aware that Paul’s chief objective was to meet Athenagoras and take concrete moves toward reunification. There were very specific and surprisingly substantive side meetings of dignitaries, prelates, and theologians before and during the actual visit. In the weeks that followed, it became clear that, despite the frank meeting and evident good will between Pope and Patriarch (and the optimism of those of us who had participated in some way), the structures behind them were simply too deeply entrenched to accommodate each side without painful and complex opposition. I think that Paul measured his papacy on how effectively he advanced reunification and still contended with the inertia of the church’s structure, driven by overriding motivation directly to reach into and reflect the faith and action of the church’s populace. Unfortunately, even bigger and wholly disastrous surprises lay just over the horizon, and it is by them that his pontificate must also be measured. All that needs to be said about Paul V1 can be seen in the Italian magazine Chiesa Viva and the book wrote by a very holy priest Fr, Luigi Villa on the sanctity of one Giovanni Montini aka. Pope Paul V1 a real eye opener on what people today call Catholic.